Did you know you can make your own ice cream with only a couple ingredients, none of which contain dairy? I love the texture and temperature of ice cream but would prefer to skip the animal products. This is precisely why I call it “nice” cream: cruelty-free and full of compassion. It was also quite cheap as I picked these blackberries off the side of the road (I love the bountiful berries come summertime in BC!). Cow’s milk contains insulin-like growth factor-1 which may increase the risk of breast cancer. It can also spike insulin levels contributing to inflammation and acne, especially in women with PCOS. Plus, studies have shown milk consumption doesn’t actually decrease the risk of osteoporosis and may actually rob our bones of calcium due to its acidity. So give this non-dairy cold dessert (or breakfast) option a try and let me know your thoughts! Peel and chop bananas the day before (or longer) and freeze in tupperware or plastic bags along with the blackberries. Remove frozen bananas and blackberries from freezer and blend in food processor with protein powder and ice. You can add liquid if it isn’t blending well but limit liquid for a thick consistency. Add toppings like fruit or nuts and enjoy before your nice cream melts! That’s great that you can make some ice-cream that doesn’t contain dairy, since a lot of people are lactose intolerant. It looks delicious! Totally! Myself included! Thanks so much for popping by. Oh my! Cannot wait to try! Looks & sounds delicious. No, I didn’t know.I just made homemade ice cream loaded with dairy and it’s awesome to know that there’s a non-dairy alternative. And those colours – so vibrant! You have the most beautiful pictures of any blog I have visited…they are so colorful. This color is amazing and it looks so yummy. Oh man, this looks so good! I’ve found it super difficult to find good vegan ice creams, even living in a big city, so something like this is absolutely perfect! I’m in Chicago! The vegan ice cream options exist but they’re few and far between and, as you mention, are pricey! I love going to little produce markets and farmers markets to get some great fresh berries. So clearly I’m going to have to do this. Lately I’ve had such a sweet tooth, this looks so good and I won’t feel bad for eating it! I’m a PCOS gal too. And, yep, no milk for me. I use unsweetened almond milk when I need to. I love how your blog is designed. What a great recipe with such fabulous color! Love the ingredients & how easy it is to make! Great backdrop for your photos, too! Luscious and refreshing. How perfect! Well done!!! Hi, not quiet the blackberry season here yet. I hope to give it a try when it is, delicious, Chloe. Nice! Where are you from and when does blackberry season begin?? Hi, anytime soon I can see the berries in bloom now. Oh I’m from the UK. That’s amazing presentation D! Love the description and the photos. Makes me long for Pender already! Banana ice-cream is great but how do you do it so it doesn’t knacker the blender? I’ve burned out two. Very good point. I use a food processor when I can, and if I must use a blender then I add liquid like almond mylk or water (just enough to get everything moving). I have heard really powerful blenders, like a Vitamix, can do it no problem with no liquid (this is a dream of mine haha). OMG! This looks amazing! I gotta try it!! Doing Whole 30, so this might be something for afterwards too! Blackberries are fabulous! What a nice recipe to incorporate them into a nice cold summer treat. I’ve made nice cream before but not with blackberries. It looks so good! This was my first time as well, but with all the blackberry picking I was doing I thought it was about time! Thanks for popping by. 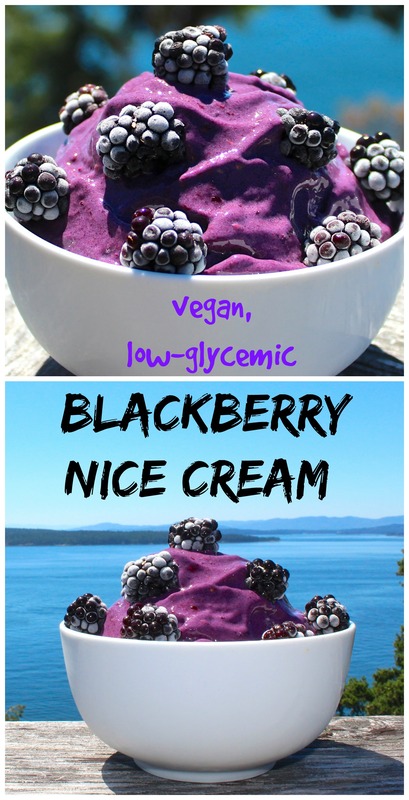 Nice Cream is one of my faves, and so are blackberries! This combination sounds perfect! this looks delicious 🙂 saved it for later! The colour of this is gorgeous! I’ve never tried nice cream, this might be my first one! Yum, can’t wait to try this, so easy too! Yummy, I have to try this very simple. Wow this looks so refreshing and delicious for a day at the beach! Wow this looks so delicious! Its hard to believe its so healthy and easy to make too. Sharing on tweeter & pinning. Visiting from Healthy Living Link up. Have a healthy, happy & blessed day! Thanks for sharing this wonderful recipe.